Browse Home Depot Weekly Ad & Sales. 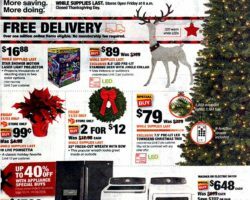 Find this week Home Depot Ad sale prices, printable coupons, current flyer savings and latest specials for appliances, tools & hardware, and more. Home Depot is the perfect place to shop for decently priced home improvement products. With friendly and knowledgeable staff, it is able to provide top-notch service, and carrying a big selection of items with hassle-free return policy, they make shopping effortless and stress-free. As an online retailer of all things home, The Home Depot has free 2-day delivery on thousands of items and online-exclusive deals in the garden center, for power tools accessories, outdoor equipment and home electronics. Bestsellers include wall mounts, bath faucets, ceiling fans and plumbing parts. 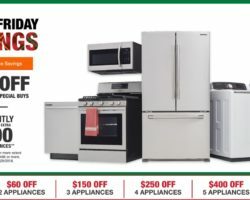 With up to 25% off appliances, Home Depot is a good spot for shopping refrigerators, dishwashers, blenders and other big or small kitchen appliances, with special financing available every day. The store has special offers for outdoor activities like gardening and more deals in select departments. Customers who shop online can choose pickup service and return at any store.